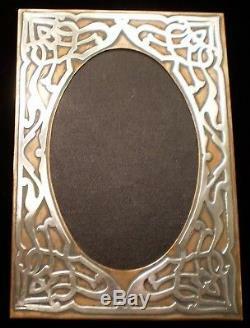 Heintz Art Metal Shop Arts and Crafts picture frame features an arabesque sterling overlay. Unmarked except "STERLING" stamp in the lower left corner. Most likely made before the shop mark was implemented in 1912. 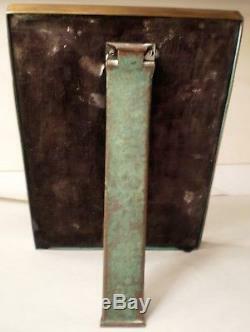 The front originally had a verdigris finish which is still on the easel leg. Has a mellow patina now. Measures 4-13/16 x 7 inches. It is in Very Good condition. 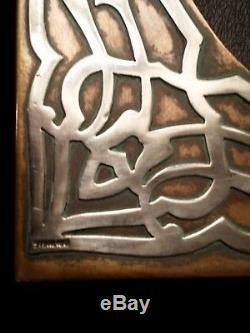 The item "HEINTZ ART METAL SHOP Arts and Crafts Picture Frame" is in sale since Friday, March 23, 2018. This item is in the category "Antiques\Periods & Styles\Arts & Crafts Movement". The seller is "stickleyspeaking" and is located in Kelso, Washington. This item can be shipped worldwide.